Today takes on an Illinois flavor, looking at one bright idea from the folks in Springfield. AKA, raise taxes on almost everybody. Illinois has a “flat” state personal income tax, currently 4.95 percent. After deductions or other adjustments, you pay 4.95 percent of your income — whether you earned $10,000 or $10 million. 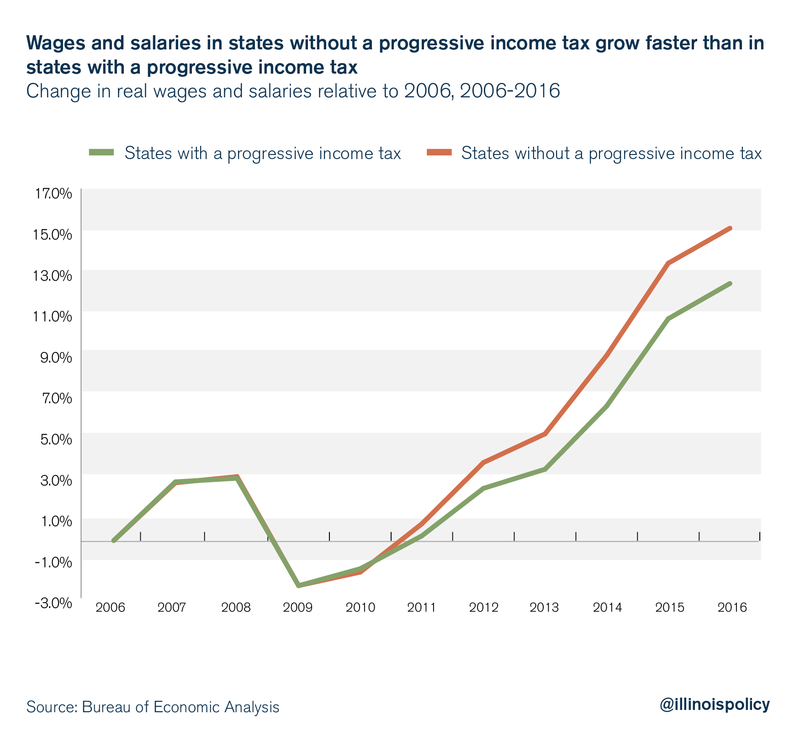 All but one of the Democrats running for Illinois governor have advocated for some kind of progressive tax. Most lack specifics so far. The idea presumably would be to set high brackets to reap extra taxes from the relatively wealthy, without affecting the middle class. That concept contrasts with Missouri, which has 11 brackets, all aimed at extremely low income levels. There is no distinction between the middle class and the rich, taxing all income over $9,001 at the top rate of 6 percent. I’m having an issue interpreting this. Let me go to the Tax Foundation for details: Facts and Figures 2018: How Does Your State Compare? (a) These states allow some or all of federal income tax paid to be deducted from state taxable income. (b) Local income taxes are excluded. Fourteen states have county- or city-level income taxes; the average rate within each jurisdiction is: 0.5% in Alabama; 0.63% in Delaware; 1.56% in Indiana; 0.45% in Iowa; <0.01% in Kansas; 2.08% in Kentucky; 2.89% in Maryland; 1.70% in Michigan; 0.5% in Missouri; 0.50% in New Jersey; 1.94% in New York; 2.25% in Ohio; 0.37% in Oregon; and 2.95% in Pennsylvania. Average local rates are from the Tax Foundation, 2018 State Business Tax Climate Index. © 2017 brackets due to data availability. Okay, that’s on a par. How about when we throw all the taxes in? They also have an analysis which shows that everybody’s taxes would need to be increased. When progressive tax proposals such as Daiber’s fail to generate necessary revenue, income tax rates on the middle class are bound to go up, just as they have in New York. The Treasury Department said this week that residents of Illinois who prepaid property taxes last year should be able to deduct them. The department issued this clarification in a letter to Rep. Peter Roskam (R-Ill.), a senior member of the House Ways and Means Committee whose district includes suburbs of Chicago. The IRS issued an advisory shortly after the tax law was signed that said people could deduct prepaid 2018 property taxes only if the taxes were both assessed and paid in 2017. The guidance created some confusion, including in Illinois. In that state, taxpayers pay property taxes for the previous year, so taxpayers prepaying property taxes at the end of 2017 were prepaying 2017 taxes, not 2018 taxes. Roskam wrote a letter to the Treasury Department seeking clarification that the IRS advisory did not pertain to prepayments of 2017 property taxes, and the Treasury Department agreed. I “pre-paid” taxes, but that wasn’t accurate. The tax payment wasn’t due until January 31, 2018… but I got the bill in September 2017. So it wasn’t really a prepayment. I paid it before the due date… and before the end of the year. I’m not yet adding in married couples. Let’s just keep to single filers, with dependent minors, and try out a few scenarios. Let’s do the combos done before… just with 1 child dependent. So we’ve got the general shape of our curves — In all cases, higher incomes pay higher taxes within any specific tax regime. However, the steepness of this rate curve differs between the two regimes, and sometimes cross over each other — which is how some end up with tax increases in places that look odd. Remember: negative means the new bill cut your taxes, positive means it raised them. That never actually peaks above 0 – that’s an artifact of the splines used in drawing a smooth graph by Excel. I didn’t fix the vertical axes on that, but you can see for $500K there are very slight increases in tax paid. Again, the $400K – $500K scenarios pay slightly higher taxes. And now we’re seeing a bit into the much much higher income levels. I did some more combos in the spreadsheet (linked below), but they don’t behave all that differently. And these are very wide scenarios to grab at the ones who get a hit. Not that many people are booking $400K in income, are single filers, and have one child dependent. Sure, there may be a few, but generally at that income level a whole bunch of things will be going on. It’s when we start getting a bit more real — with state income taxes AND local property taxes AND children AND married…. well, we’ll see in the future scenario tests. When you’ve got more going to states in state income tax than federal income tax… well, you can see why the high tax states are jealous. Here’s the spreadsheet with results.